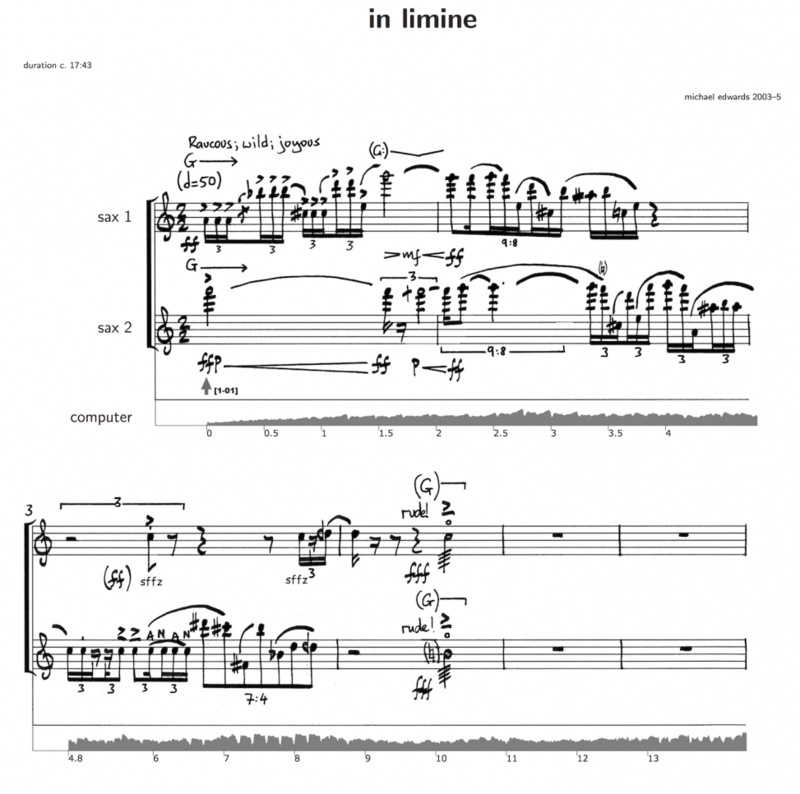 Henrique Portovedo and I have just finished recording my piece in limine, for two soprano saxophones and computer, written 2003-2005. We’ve now got to work on the mix and master before Henrique puts it on a release he has planned of my complete works for saxophone and electronics. I’ll be working first of all on a surround mix but a stereo release will be the main format, as usual. Henrique and I have worked together on several occasions now. For this project he came by first of all last July, again in January, and specifically to finish in limine at the end of June this year. He recorded both soprano parts via overdubbing. Most of the time he didn’t listen to the previously recorded part whilst laying down the second part, rather, he synchronised to a click track. Never an easy or enjoyable job, but with music of this nature, it’s almost impossible to record both parts without one. 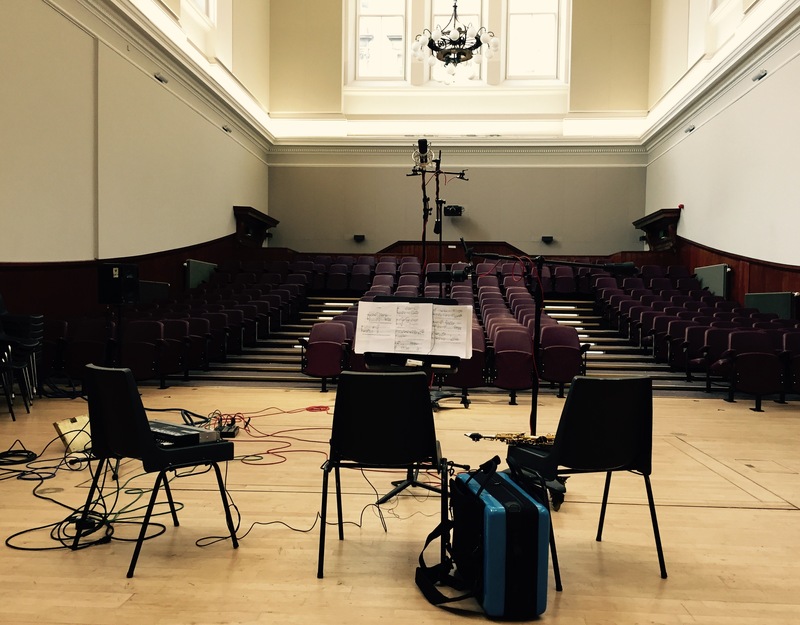 On each occasion we recorded in the Reid Concert Hall, Edinburgh. An already difficult project was sadly made more difficult by the neighbouring McEwan Hall and Bristo Square refurbishment that’s been ongoing for the last two years. Heavy machinery, stone cutting, and general building site noise, with workers on permanent overtime, made recording possible for only a few hours each evening. The main microphone used was the Rode NTR ribbon, sideways on, just above the music stand. Hardly a secondary mic but nevertheless not used as much in the mix up to now was the Neumann U89, as an overhead. To capture the room we used two Schoeps MK2 omnis, placed about 4m from the sax position. For reinforcement where necessary, as well as a feed into the electronics, we used a DPA 4061, mounted on the sax.